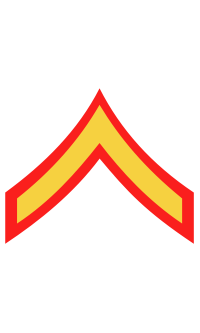 PFC Walter Carleton Monegan, Jr.
Walter Carleton Monegan, Jr. was born on 25 December 1930 in Melrose, MA. He attended schools in Malden, Reading, and Walpole, MA, and in November 1947 (prior to his 17th birthday), enlisted in the Army. He was discharged in January 1948, when his age was discovered, and enlisted in the U. S. Marine Corps on 22 March 1948 in Baltimore, MD. After completing his recruit training at Parris Island, SC, in June 1948, Monegan was ordered to San Francisco, where he sailed for duty in China with the 3rd Marines at Tsingtao. He returned to the United States in June 1949 and was stationed at Camp Pendleton, Oceanside, CA, until June 1950, when he was ordered to the Marine Barracks, Naval Air Station, Seattle. While in Seattle, Monegan married. He re-enlisted on 20 July 1950, and the following month returned to Camp Pendleton, where he joined the 2nd Battalion, 1st Marines, First Marine Division. Monegan shipped out to Korea where he participated in the Inchon landing on 15 September 1950. His unit then moved on toward Seoul. On 20 September 1950, outside of Seoul and near Sosa-ri, his unit encountered an overwhelming enemy tank and infantry attack. He was killed as he calmly stepped out into the heavy fire and proceeded to methodically knock out the tanks at close range with his bazooka. PFC Monegan was posthumously awarded the Medal of Honor for his heroic actions. 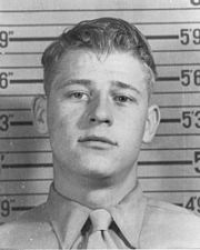 PRIVATE FIRST CLASS WALTER C. MONEGAN, JR.
For conspicuous gallantry and intrepidity at the risk of his life above and beyond the call of duty while serving as a Rocket Gunner attached to Company F, Second Battalion, First Marines, First Marine Division (Reinforced), in action against enemy aggressor forces near Sosa-ri, Korea, on 17 and September 20, 1950. Dug in a hill overlooking the main Seoul highway when six enemy tanks threatened to break through the Battalion position during a pre-dawn attack on September 17, Private First Class Monegan promptly moved forward with his bazooka under heavy hostile automatic weapons fire and engaged the lead tank at a range of less than 50 yards. After scoring a direct hit and killing the sole surviving tankman with his carbine as he came through the escape hatch, he boldly fired two more rounds of ammunition at the oncoming tanks, disorganizing the attack and enabling our tank crews to continue blasting with their 90-mm guns. With his own and an adjacent company's position threatened by annihilation when an overwhelming enemy tank-infantry force by-passed the area and proceeded toward the battalion Command Post during the early morning of September 20, he seized his rocket launcher and, in total darkness, charged down the slope of the hill where the tanks had broken through. Quick to act when illuminating shell hit the area, he scored a direct hit on one of the tanks as hostile rifle and automatic weapons fire raked the area at close range. Again exposing himself he fired another round to destroy a second tank and, as the rear tank turned to retreat, stood upright to fire and was fatally struck down by hostile machine-gun fire when another illuminating shell silhouetted him against the sky. Private First Class Monegan's daring initiative, gallant fighting spirit and courageous devotion to duty were contributing factors in the success of his company in repelling the enemy and his self-sacrificing efforts throughout sustain and enhance the highest traditions of the United States Naval Service. He gallantly gave his life for his country. The Medal of Honor was presented to his widow, Elizabeth Clark Monegan, by Secretary of the Navy Daniel A. Kimball, during ceremonies on 8 February 1952 in Washington, DC. 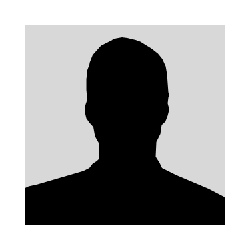 His son is Walter Carleton "Walt" Monegan III (born May 1951) the former Police Chief of Anchorage, AK, and Public Safety Commissioner of Alaska. His dismissal in July 2008 by Alaska Governor Sarah Palin drew considerable attention, particularly after Palin's selection as the Vice-Presidential nominee for the Republican Party in August 2008. Monegan accuses Palin of not telling the truth about the reasons for his dismissal. Walter Carleton Monegan, Jr. was originally buried in Inchon, Korea, but was re-interred on 19 July 1951 at Arlington National Cemetery in Arlington, VA.